Last summer while I was researching an article for National Geographic magazine in Ecuador, I had the remarkable pleasure of staying at the Hacienda Guanchala. Lying almost exactly on the equator, the Hacienda Guanchala is the oldest colonial hacienda in Ecuador. Indeed, some of its buildings date back as early as 1580, and its shadowy corridors feel haunted by all the history that has passed through them. I arrived at the hacienda late in the day, well after dark, and after dining there I retreated to my room and lit a fire in the old stone fireplace. Someone had left several glossy Spanish language magazines there, and so I began to thumb through them: they were all devoted exclusively to the Peruvian Paso horse. I had never heard before of the Peruvian Paso, and I was too tired to dig out my Spanish-English dictionary to begin translating the articles. But I was much struck by the athletic appearance of this horse–with its massive deep chest and its powerful looking haunches. 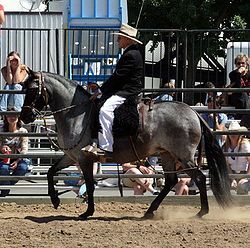 Yesterday, I came across a fascinating blog post on the Peruvian Paso. It turns out that the Francisco Pizarro and his men brought the ancestors of this horse with them when they landed in Tumbes in early 1532 and embarked on their invasion of the Inca Empire. And they later rode and led these horses by halter through the Andes to a fateful encounter with the new Inca emperor, Atahualpa, in the provincial center of Cajamarca. Atahualpa had just defeated the forces of his half-brother Huascar in a lengthy civil war, and he was resting with his wives, lords and elite bodyguard in the hills outside Cajamarca. He and his entourage had never before seen a horse. But in the preceding months, Inca scouts had sent them a good deal of intelligence about the Spanish invaders and the large foreign animal they rode. Pizarro sent one of his bolder captains, Hernando de Soto, and several men out to Atahaulpa’s camp to invite him to a meeting in Cajamarca. To impress on the Inca entourage the power of horses, de Soto first led a charge on several of Atahualpa’s bodyguards, sending panic into the crowd. Then the Spanish captain reined his horse in sharply and trotted over to where Atahualpa sat on a low wooden throne. He nudged his horse so close to the divine king that the animal’s exhalations ruffled the braided royal fringe–a mark of imperial office–that hung from Atahualpa’s forehead. But the emperor betrayed no fear: he sat impassively as the animal gazed down at him. Tragically the intelligence that Atahualpa had received about the Spaniards was badly flawed. His scouts informed him, for example, that the Spanish could not ride their horses in the dark. So Atahaulpa delayed his arrival at Cajamarca for the meeting until late afternoon the next day. But the Spanish forces and their horses were ready and waiting, quickly slaughtering the emperor’s bodyguard and taking Atahualpa himself a prisoner. Seldom has one breed of horse witnessed so much tragedy and misery. My apologies to subscribers who received a garbled version of this blog earlier today. Something went a little wrong in the blogging software this morning. I’m a recent subscriber to your blog and have quickly come to enjoy and look forward to your almost daily missives on all things archeological. Thanks, Bruce! I enjoy posting here, as I have the freedom to write what I want–not always the case with my magazine work.